Misspelling by writing “tawk” in our blog post title? No! “Tawk.to” is the chat software we use at Steve Wallace Real Estate online. Let’s talk real estate by chatting online with our chat software, by phone call, text message or by email. Ask Wallace to get your area and real estate questions answered. Visit Steve Wallace Real Estate online today. Note the chat option in the lower right of your desktop computer screen. Click on the up arrow in the chat box and a window will open. Type in your name, email address and a message or question. If resident South Carolina Real Estate Agent, Steve Wallace, Realtor in Bluffton, is online, start chatting. If Steve is offline you can send him a message through our tawk.to chat software. 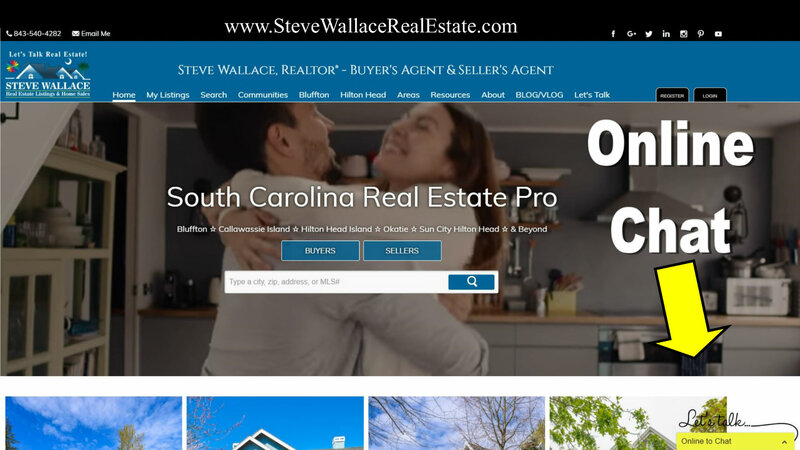 At Steve Wallace Real Estate online, you’ll find the most comprehensive collection of Greater Bluffton, South Carolina real estate properties and homes for sale. Find new homes, resale single family homes, townhouses, condominiums or condos which we call villas, lots, and land for sale. You’ll find the most affordable to the most luxurious homes in our many neighborhoods, plantations, and villa complexes. Chat with Steve to learn more. For fast service, pick up your phone and call Steve direct. Let’s talk real estate!